Grow more plants in a smaller space without soil? While it sounds too good to be true, these are some of the real-life benefits that have more and more gardeners trying hydroponics at home. If you’ve ever taken a stem cutting from a plant and stuck it in a glass of water to grow roots, you’ve taken advantage of hydroponics. The word, “hydroponics,” comes from the words “water” and “labor,” and it describes a method of growing plants in a soil-free, nutrient-rich water solution. An increasing number of fruits and vegetables found in grocery stores are produced hydroponically, but this soil-less method of propagation isn’t limited to commercial growers. 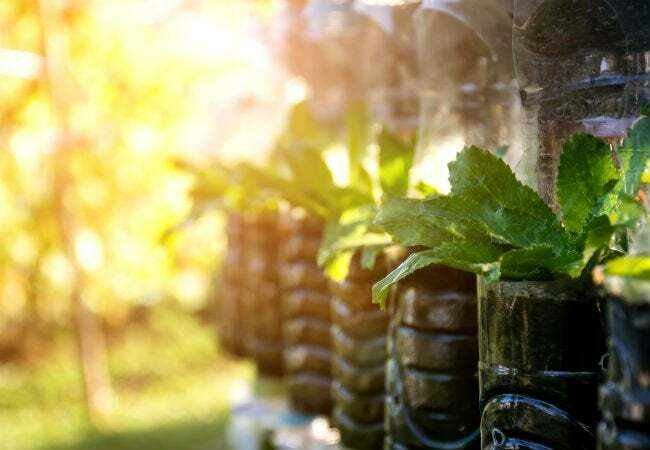 Indeed, homeowners are taking advantage of smaller-scale, DIY hydroponics to cultivate delicious herbs, fruits, and vegetables—even during winter. Cultivating plants in a watery environment isn’t a new idea. The Hanging Gardens of Babylon are thought to have been a crude predecessor of today’s hydroponics, but it wasn’t until the 1930s that scientists began experimenting with the process on a greater scale for food production. 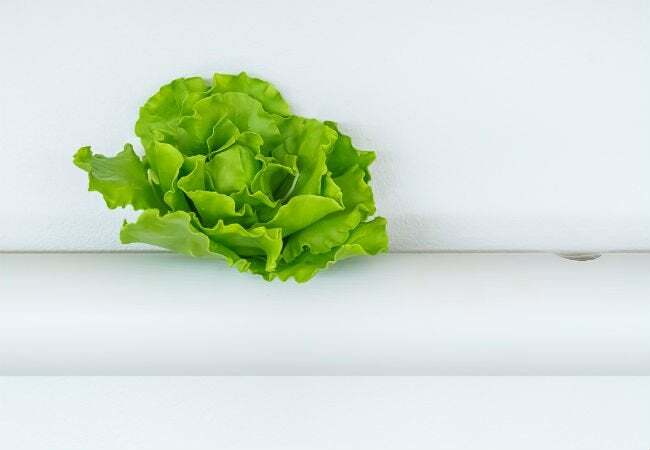 Today, the use of hydroponics for growing vegetables and fruits is widespread; self-contained hydroponic systems can be found in submarines, off-shore drilling rigs, space stations, and on produce farms in almost every nation. 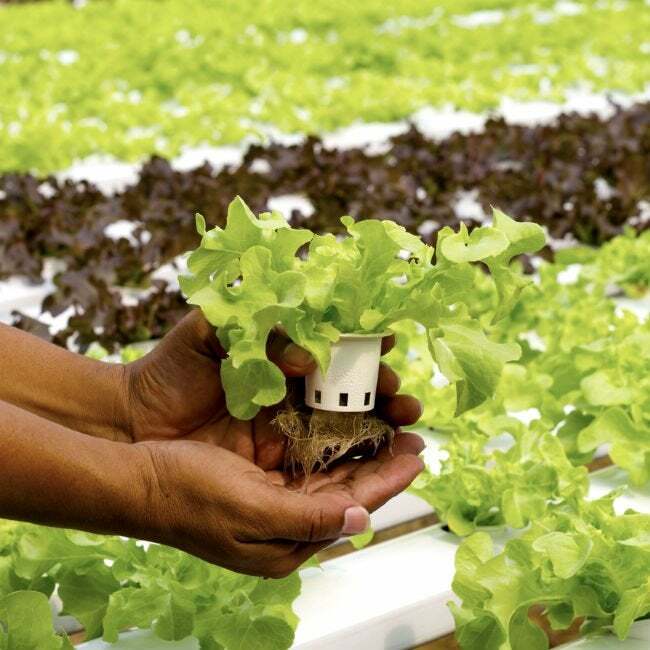 Hydroponics offers high yields in a fraction of the space required by traditional farming, making it a vital method for ensuring worldwide food security. It’s also quickly becoming a popular way for homeowners to grow their own fresh produce. In a hydroponic system, plants are grown in a sterile growing medium, such as Rockwool, coconut fiber, perlite, or sand. Unlike soil, the growing medium is inert, meaning it doesn’t contain any minerals, nutrients, or chemicals that will affect the plants. Lightweight plastic net pots are frequently used to contain the growing medium and the plants. The net pots are then put in into larger sealed enclosures where they receive water. 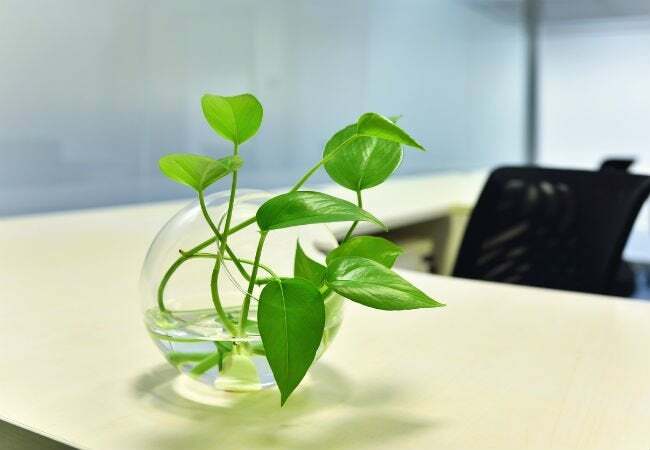 While hydroponic systems vary greatly in design, they all operate on one basic principle: They all make use of water to deliver nutrients and oxygen to the roots of the plants. A hydroponic system can be a large unit that supports many plants, or it can be a small pot with a single plant. It’s not the size that makes it hydroponic, but rather the method of growing the plant. The following basic hydroponic methods are used extensively in commercial systems and are often copied and adapted by crafty gardeners in creating their own DIY hydroponic systems. • Drip hydroponics: Water is supplied to growing medium in net pots at the surface using a drip irrigation system, and then allowed to drain out the bottom of the pots. The bottoms of the net pots are situated in a closed container so plant roots don’t dry out too quickly. • Flood-and-drain hydroponics: Water circulates below the net pots but does not come into contact with them. Instead, wicks made from an absorbent material will soak up the water, transferring it upward to moisten the roots of the plants inside the netting. When it’s time to water, the water is pumped through the container beneath the wicks just long enough for them to become saturated. Then, the water is drained into a reservoir and reused for subsequent watering sessions. • Water culture hydroponics: The roots of the plants are partially subjected to water on a continuous basis. In this system, the bottoms of the net pots are positioned just above the level of the water and a pump is used to create bubbles that make contact with the net pots, keeping the growing medium and roots moist. • Aeroponic hydroponics: Similar to water culture hydroponics, an aeroponic system wets the bottom of the net pots directly, but instead of bubbling water, the roots and growing medium are moistened through the use of a misting system located in the container below the plants. If you’ve ever had an outdoor garden, you’ll immediately recognize some of the following benefits of growing plants in a hydroponic system. • No hoeing or weed-picking necessary. • No need to use pesticides to eliminate crawling insects that eat your plants. • Plants grow more quickly because their roots don’t have to push through compact soil. • Plant roots absorb nutrients more quickly from water than they do from soil. • Access to fresh-picked fruits and vegetables any time of year. • Hydroponic plants are not subject to soil-borne diseases. • The system can be set up indoors or outdoors. • High-yield production in a small space. • While there are commercial kits available, it’s entirely possible to DIY hydroponics at home. You can find a wide variety of commercial hydroponic systems on the market, but they’re usually a bit on the pricey side. A snazzy-looking self-contained unit with room to grow six to 12 plants, complete with grow lights, a timer, and Wi-Fi capability to notify you via your smartphone when it’s time to add nutrients, runs $125 to $350. These units are attractive on the kitchen countertop and will produce fresh herbs year-round without the need for window lighting. If you’re into large-scale gardening, you can find commercial hydroponic systems designed to accommodate dozens—or hundreds—of plants. These units contain everything you need; lighting, pumps, tubes, and containers. They start around $1,000 and go up from there. If you want to grow and sell your produce at farmer’s markets or to local grocers, a large commercial unit can be a good investment. PREFER TO BUILD YOUR OWN UNIT? • Restructuring an empty plastic bottle as an individual planter. Cut the top quarter off a 2-liter soda bottle, fill the bottom part with water, and then place the top part upside down in the bottom part to use as a growing pot. This inexpensive unit features piece of a natural fiber rope, such as jute, inserted through the cap into the water below to act as a wick to draw water upward and keep the growing medium moist. • Making use of polyvinyl chloride (PVC) pipe, sometimes in elaborate configurations. Horizontal PVC pipes carry nutrient-rich water to the bottoms of individual net pots, which are inserted in holes drilled in the topside of the pipes. Water is pumped through the pipes by a submersible pump located in a large container of water to which nutrients have been added. • Repurposing a large container so that its basin holds water. Reservoir systems can make use of a 5-gallon plastic bucket or another large plastic container with holes drilled into the lid to insert net pots and plants while water fills the bottom. No matter how large or small you design your hydroponic system, the following tips will help you grow healthy plants. • Provide enough water to moisten the roots of the plants, but not so much that they’re consistently sopping wet. • Keep the water moving, either by the use of a pump, sprayers or a drip irrigation system. • Use filtered water in your hydroponic system. Tap water contains chemicals and pathogens, which can negatively affect your plants. Water from a reverse osmosis (RO) system is a good choice, but if that isn’t an option, filter tap water through a portable water filter. • Use supplemental lighting if natural sunlight is unavailable. You can purchase commercial grow lights or fluorescent lights to supply the additional light your plants need to grow. • Use a bubble system, such as those found in fish tanks, to infuse the water with oxygen, which is necessary for healthy plant growth. • Maintain a consistent water temperature between 65 degrees Fahrenheit to 75 degrees Fahrenheit. Colder water can slow plant growth, and warmer water is at risk of developing fungus and algae. • Use a pH tester to ensure that the water in the reservoir is not too acidic or too alkaline. Most plants require a pH between 5.7 and 6.3 for healthy vigorous growth. When an imbalance occurs, add an acidic- or an alkaline-correcting product to bring the water back into balance. • Apply nutrients and fertilizers to the water reservoir as recommended by the manufacturer of the fertilizers you’re using.